Moments from AU Student Media's conversation with the young advocates. Before the “Parkland Students” went on stage and spoke in front of a sold-out Bender Arena for an event hosted by the Kennedy Political Union, student media had the opportunity to interview them behind closed doors Wednesday evening. 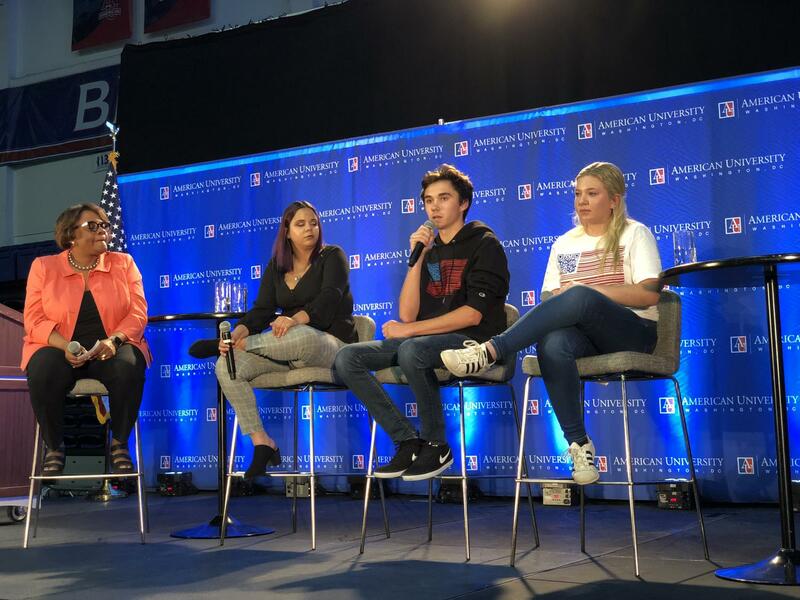 David Hogg, Jaclyn Corin, and Samantha Fuentes, founders of “Never Again MSD,” and survivors of the Marjory Stoneman Douglas shooting in February 2018, entered a room in the depths of Bender Arena 25 minutes before they were scheduled to speak. After a few moments of silent stares, a student journalist from the Eagle asked if there were any midterm elections that they were excited about. Corin is referring to Jackson Hinkle, Jake Rybczyk, and Mahmoud El-Farra, 18 year olds running for Orange County City Council this election cycle. Their campaigns were started with the help of Orange County Students for City Council, a youth-led organization whose mission is to mobilize young progressive students to run for city council seats in Orange County, according to the organization’s website. The students of Orange County have six candidates running between the ages of 18 and 27, but managed to register 900 young progressives to register to run in only two days, according to Hogg. Although not everyone can (or wants to) run for office, young people need to vote and force politicians to listen to their concerns, Hogg said. The efforts of Hogg, Corin, and Fuentes has been successful in in their quest for gun legislation, although they have faded from the news cycle. In the six years between the shooting in Newtown and the shooting in Parkland, only 30 gun laws were passed at the state level. In the eight months since Parkland, there have been over 60. Beyond their success with gun legislation, the Parkland Kids said that they are also hurting the largest gun advocacy group in the country, the National Rifle Association. “The NRA spending for this election cycle in terms of advertisements is down about 90% compared to 2016, Hogg said. “Their revenue overall is down $35 million this year. It’s interesting that they say they’ve gained a million new members in the past 2 years, and they’ve raised their membership fees twice, but they’re still losing money. You would think that would correlate to a positive increase in revenue, but it didn’t. So my question is: are they bullshitting us?” Hogg said. The NRA’s deficit in 2017 was $31.8 million, and falling revenue from membership dues was the biggest driver of this deficit, according to Open Secrets, a political watchdog group. This deficit could be a reason behind the NRA’s lack of spending for the upcoming midterms. For the 2014 midterms the NRA spent $16 million, but has only spent $1.6 million for the 2018 midterms, according to Mcclatchy DC Bureau. Although Hogg is proud of these numbers, he says that the Never Again MSD movement is not anti-gun, but anti gun violence, a fact often misconstrued by the media. Fuentes agreed with Hogg and said that the goal is to keep weapons out of the hands of people with bad intentions, not responsible gun owners who respect the second amendment. A point of criticism for the Never Again MSD Movement, namely by their black classmates at Marjory Stoneman Douglas High School, is its lack of diversity. Most of its’ founders are white, Parkland Florida’s median household income of $128,292, and Marjory Stoneman Douglas is 61% white. Despite this, Hogg, Corin, and Fuentes said they are focused on including a diverse group of people focused on gun legislation. Corin said that she recognizes her privilege and hopes to use it to give a voice to marginalized groups. Corin used the story of Zaire Kelly, a 16-year-old African American, who was shot at a convenience store in Northeast Washington, D.C., as an example of the marginalization of people of color when discussing gun violence. According to Corin, Kelly’s death was viewed as gang violence, which she says isn’t fair. “We need to make sure that rhetoric — that if its a person of color, its automatically gang violence — ends,” Corin said. Zaire’s twin brother, Zion, spoke at the March for Our Lives last March and is now an active member of Never Again MSD. Hogg, Corin, and Fuentes took the stage at Bender Arena a little after 7 pm after a long introduction from AU President Sylvia Burwell. “Who’s ready to vote!,” Hogg said to the crowd. Michael Karlis is a Sophomore and the Web Editor at AWOL.